Introducing Half Disarticulated Budget Skeleton w/ Skull! This new budget-friendly skeleton model will surely give value for your money. The Half-Disarticulated Budget Skeleton w/Skull is perfectly designed for budget-conscious students of anatomy. So, if you are a student and in search of an affordable and economical skeletal model that is easy on the pocket, this product is just right for you! The Anatomical Chart Company is a principal maker of high-end and pocket-friendly anatomy models and anatomical charts that are widely used in classrooms, medical clinics and hospitals across the globe. They continue to develop products that are designed to enhance learning of the human anatomy. This disarticulated skeleton model provides great support for the fundamental study of the human skeletal anatomy. It consists of a half adult-sized skeleton with a 3-part skull, and appendages such as the left hand and left foot on wire. The detached bones allow further examination of the various joints in-between. It is perfect for students of skeletal anatomy who are in search of a budget-friendly prototype for study. It also serves as a great teaching aid for lecturers and professionals in the medical field. HALF DISARTICULATED SKELETAL MODEL WITH SKULL- It consists of a half adult-sized skeleton with a 3-part skull, and appendages such as the left hand and left foot on wire. DETACHEABLE BONES- The detached bones allow further examination of the various joints in-between. WORLD CLASS QUALITY- This Half-Disarticulated Budget Skeleton w/ Skull! A principal maker of high-end and pocket-friendly anatomy models and anatomical charts that are widely used in classrooms, medical clinics and hospitals across the globe. I was so excited that this product was offered at such an affordable price. 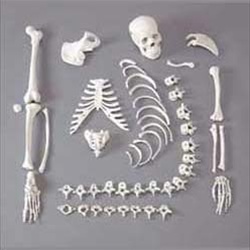 I have been wanting to purchase a skeleton for teaching purposes for many years. I teach in a dance program and am a somatic educator as well. My students and clients are able to have a hands on approach to understanding anatomy. I studied the skeleton system on this model. Got an "A"
The half disarticulated skeleton allows me to supplement lecture material with labs on skull and skull features, rib cage and sternum, upper and lower appendages, as well as using clay to put bones together to show the types of joints in the skeleton.